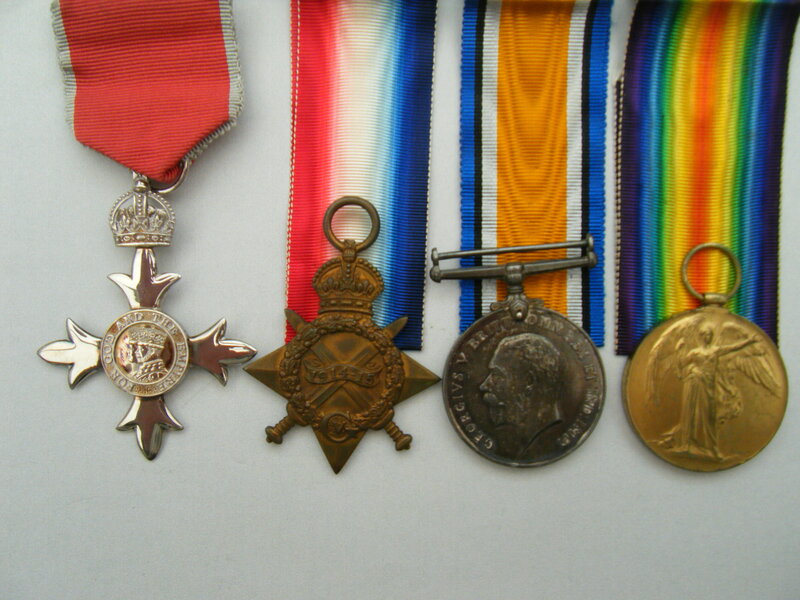 WW1 medal GROUP (& MBE) awarded to George Eric Warner Lacey, Surgeon Lieutenant Royal Navy (later Royal Navy Air Service followed by RAF). Lacey was born on the 7th December 1885 in Woolwich, London, England. MBE unnamed as issued and comes in its presentation box. 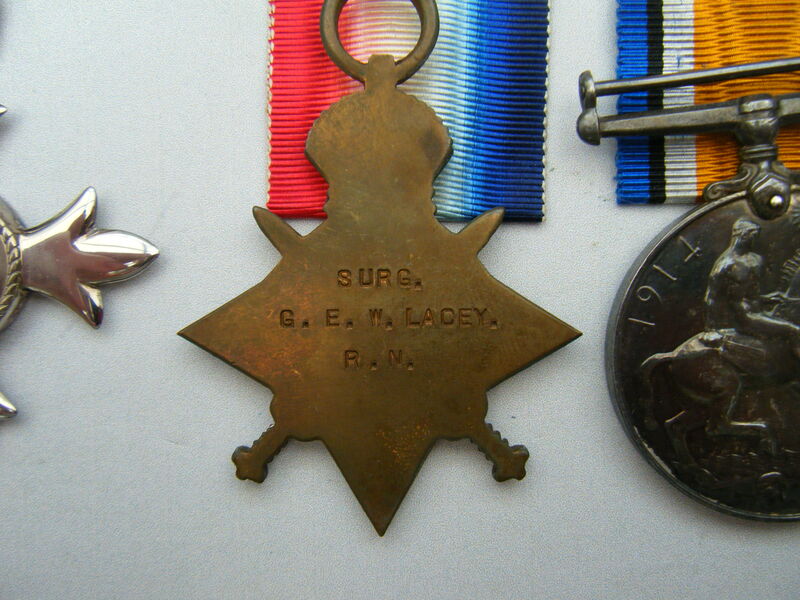 1914-15 Star named to SURG. G.E.W. LACEY., R.N. 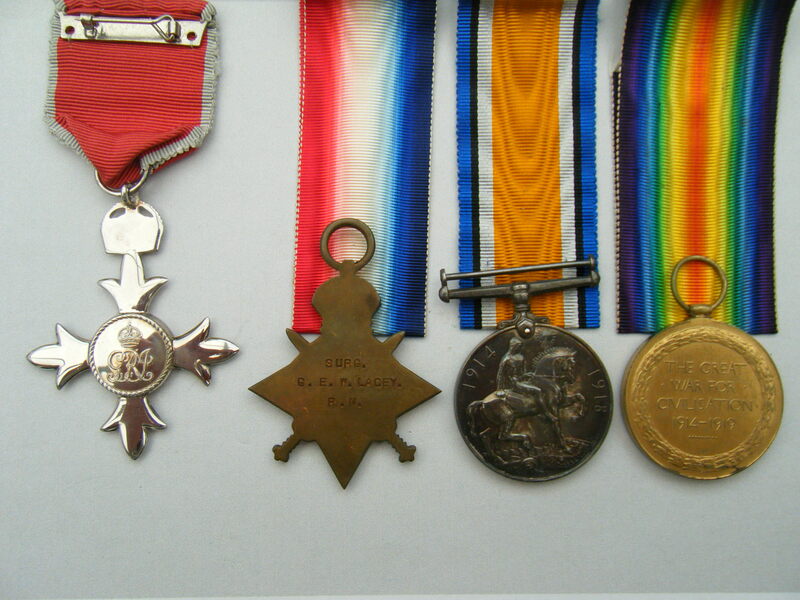 British War Medal and Victory Medal named to SURG. LT G.E.W. LACEY., R.N. 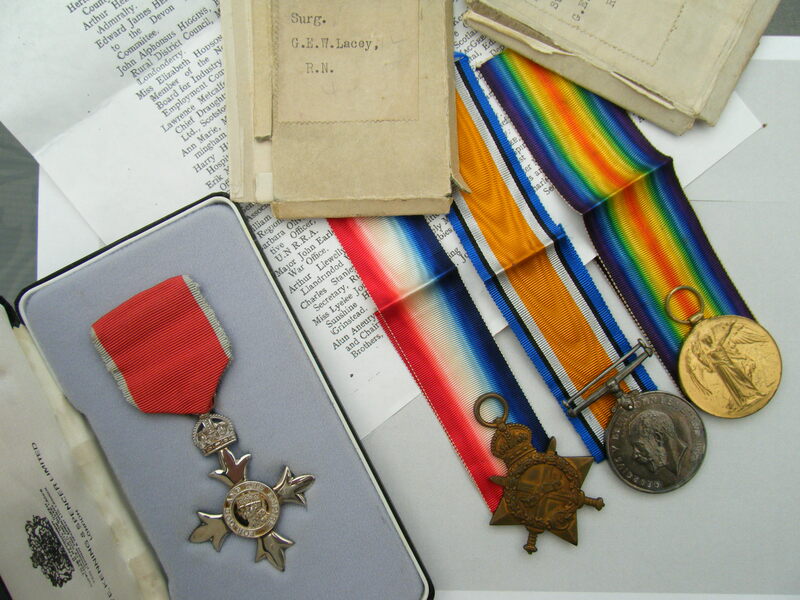 The medals come with the original ribbons AND boxes of issue. The ribbons are in perfect condition. The group also includes a paper copy of his Royal Navy Medal Roll, which can also be viewed by clicking on here if you have a subscription to ‘find my past’. Lacey was the son of Thomas Warner Lacey and Sarah Annie (Kirbell) Lacey - and gave his address as 55 Eglinton Rd, Woolwich, London SE18. He was the husband of Winifred Alice (Beeby) Lacey, whom he married on the 25th September 1918 in Derbyshire, England. He was the father of Thomas Norman Warner Lacey MBE, DFC who served in the RAF in WW2. Lacey joined the Royal Navy in October 1914, a paper copy of the London Gazette entry confirming his appointment is included with the group but it can also be viewed by clicking on here. His details can also be found in a number of ‘Navy Lists’, two of which can be viewed by clicking on here or on here. Later he transferred to the Royal Navy Air Service, (followed by the RAF), the details of which are included with the group, but can also be viewed by clicking on here if you have a subscription to ‘find my past’. Lacey was awarded his MBE (civil division) in June 1948, a paper copy of the Gazette entry confirming the award is included with the group but it can also be viewed by clicking on here. Lacey died in 1968, there is a memorial to him and his wife (who died in 1979) inside St Winifred Church (Kingston on Soar, Nottinghamshire) which can be viewed by clicking on here. PRICE £595 - please read the terms and conditions below.